Dragon Jellyfish – From SpongePedia, the biggest SpongeBob-wiki in the world! Planktonamor (becomes enemy )takes Pearl the whale. Enemies SpongeBob Patrick and Mr. Krabs. The Dragon Jellyfish is a giant jellyfish with a dragon tail and spikes. He is owned by Planktonamor and is seen so far in Dunces and Dragons. The Dragon Jellyfish is a massive Jellyfish. It is a pink color with massive stingers. It has red spots on it and it has a sharp, pointy tail. He can be very mean, and like the other citizens of Bikini Bottomshire, he cannot stand the music that Squidly plays. He does, however, love Kabby Patties. The Jellyfish Dragon has a sort of Slavery lifestyle since he is owned by Planktonamor. He has to destroy lots of things, like Ye Old Bowling Alley and more. It is proven at the end of Dunces and Dragons that he loves the smell and taste of Krabby Patties. He lives in Planktonamor's tower, where he gets fed and sleeps. Because the Jellyfish Dragon lived with Planktonamor, it is most likely that the Jellyfish Dragon had no real family. It is possible also that he bred with another queen to make the other Jellyfish be in SpongeBob and Patrick’s generation. 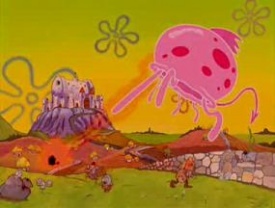 In I'm Your Biggest Fanatic, there is a big Jellyfish. That could be a descendant of the Jellyfish Dragon. It wouldn't have many friends because of its slavery to Planktonamor. It is also possible that it is related to Jellyfish King, seen in the TV Show and various Video Games. At the end of the show, the jellyfish zaps Planktonamor to death with his final words "Curses!, you win. ", indicating that the jellyfish might've joined the good guys. It is unknown as to how the jellyfish obtained a dragon's spike and tail, probably due to Planktonamor's magic. It is unsure if he was brutally slaved or not. The Dragon Jellyfish's stingers somehow aren't that lethal, unlike Big Lenny. It is possible that it became extinct. This page was last modified on 3 April 2018, at 21:51. This page has been accessed 26,779 times.